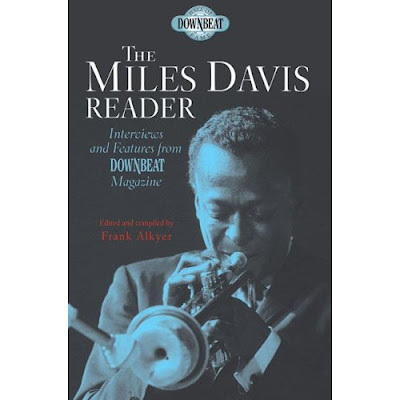 I recently listed the newly published The Miles Davis Reader as one of my recommended jazz books for the holidays. A compilation of hundreds of articles, interviews, reviews and photos from the vaults of Down Beat, it’s the first in the magazine’s new series of tributes to the legends of jazz. Do we need another tome on the inscrutable trumpeter? Between his [expletive deleted] autobiography, Quincy Troupes’ accompanying bio of the autobio, Ashley Kahn’s bio of Kind of Blue, and a rather long list of other efforts to shed light on the Prince of Darkness, what can be offered by further musings and analysis? Perspective! What makes the Down Beat collection unique in the Miles bibliography is the “in the moment” perspective: the words of reviewers at the time recordings were originally released or at the time the music was first heard on stage; the reports of events as fresh “news;” the speculation and analysis of the mysterious musician and his ever-evolving music as it evolved; the criticism and praise of his fellow musicians at each phase of his career; and above all, the “musings of Miles” from the perspective of the current moment. While the views of the artist looking back are of great value, even more revealing (and undoubtedly more accurate) are the observations and self-appraisal along the way. Miles Davis was a chameleon, a quiet, shy, self-effacing man in private, a volatile, often angry, seemingly arrogant genius in public. But as many colleagues noted throughout his career, when he was on stage, the only thing on his mind was the music. And to Davis, music was an art that had to change constantly, no matter how popular, how marketable. The drive to push every note into a new space is an overarching theme throughout the interviews, both with Davis himself and with legendary sidemen like Herbie Hancock, Ron Carter and Jack DeJohnette. It was as if Miles actually feared that repeating the same riff, the same melody, the same harmony would lead to a loss of self—a far more dire consequence than loss of an audience or plunge in sales. The polyphony of viewpoints over the span of his career, as presented in this volume, seem to organize the chaos of Miles Davis into a logical, albeit tumultuous, whole in which his seemingly multiple musical personalities merge with an intact core. As Miles played “in the moment,” The Miles Davis Reader plays back those moments, retracing the evolution of genius without the irony or bias of the usual retrospective account. For those of us who might have missed much or all of this era, for the vast majority of us who were never close enough to witness the man as he created the music, The Miles Davis Reader takes us on the journey, in 3-D. The only thing missing is the surround sound. But you can almost hear it on every page.